What are you confused on? 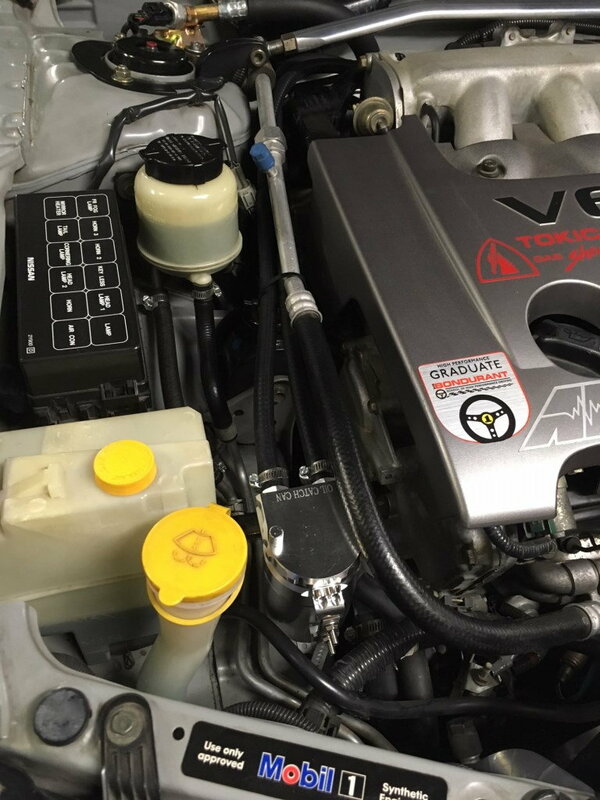 The inlet to the catch can will be from the PCV valve on the back of the intake, and the outlet will connect to the intake manifold where the original hose was. A lot of people put the catch can by the passenger side motor mount and then run the hosing to where it needs to be. You can probably tuck it to make it a cleaner look. Dont have a pic unfortunately. But as subwayvq said, your basically putting it in-line of your PCV hose. Extremely straight forward, I used one of the husky brand air compressor oil filters that home depot sells for $20. The bottom had a crappy plastic drain valve which in theory seemed cool but wasnt very airtight, so i hit it with a propane torch and melted it closed permanently. Make sure that the hose on your front valve cover that leads to the intake is still there, because that air is metered. If you leave it open youre just giving yourself a massive intake leak. That being said, screw the catch can, just delete PCV entirely and call it a day lol. Just be careful with those... they can clog. I run both valve covers to a vented catch can. The PCV valve is drilled out. My car is boosted tho. In case others want to see an install. It fit nicely behind the passenger headlight. Used an existing threaded hole (vertical) located next to the overflow tank to bolt in an L-shaped bracket. Loosely zip tied the 3/8" fuel hoses to the AC hard line. Just a cheap addw1 clone that works well. Cleaned inside of IM before install. Bottom of can is coated in oil after just 300 miles and return line is oil free. Last edited by CRBWS6; 01-30-2019 at 12:02 PM. Thanks for sharing a picture of your install. How long were the 3/8 hoses you used to connect the catch can to valve cover. Did you route both PCV valve hose and hose that would normally go to intake to the catch can? Or just the PCV (looks like its just hoses from catch can to PCV only)? I was looking to also do a catch can setup similiar to what project import does for the 350z/G35, but i was unsure where I could properly mount the catch can. Thanks for giving me some ideas. I have no idea what I'm looking but it sure looks good! How long were the 3/8 hoses you used to connect the catch can to valve cover. 2 pieces of 30" long 3/8" fuel line. Did you route both PCV valve hose and hose that would normally go to intake to the catch can? Or just the PCV (looks like its just hoses from catch can to PCV only)? Yes, I basically replaced the existing 6" long hose between the PCV and the intake plenum with the 2 new hoses and the catch can. No changes to the flow: PCV --> Catch Can --> intake.